We’re just about to begin construction of a 43′ outboard powerboat design by Reuel Parker. She will be the latest in a series of classically inspired custom powerboats we’ve built utilizing wood/ epoxy composites and outboard propulsion. But this project will not exactly be ‘business as usual’ for our shop. This will be our largest new build in nine years since we launched DELIVERANCE in 2010. This will also be the first new build at our shop built to a contemporary design that is not Doug Hylan’s in about 15 years. Reuel Parker is a very accomplished designer/ builder whose designs share a lot of principles and priorities with Doug’s work. 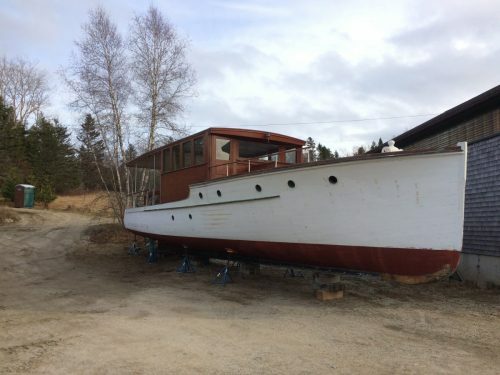 The owner’s previous boat, the 36′ MAGIC (pictured above) was designed and built by Parker. MAGIC has, and will continue to serve as inspiration for the new, more capable and commodious sister ship. We are looking forward to collaborating with MAGICs owner and Mr. Parker in creating a wonderful and unique new boat. We've installed new forward upper sheer clamps/ shelves and a new forward deck frame of laminated Douglas fir beams. 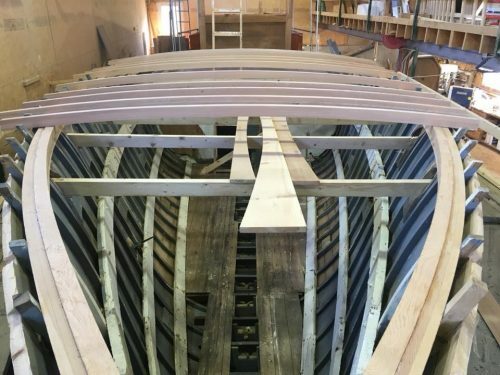 PATIENCE gets a new (old) forward sheer line and a new foredeck frame. We’ve installed new forward upper sheer clamps/ shelves and a new forward deck frame of laminated Douglas fir beams. Kit is currently fitting the new upper stem piece. Soon we’ll be re-planking from the lower sheer up to the raised deck sheer. 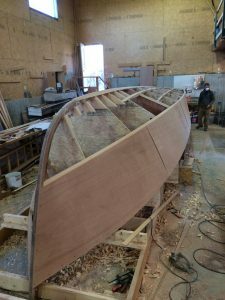 Last fall we built a Marsh Hen design “bare hull.” Her owner, a recently retired architect, will finish the boat at his shop in Castine. 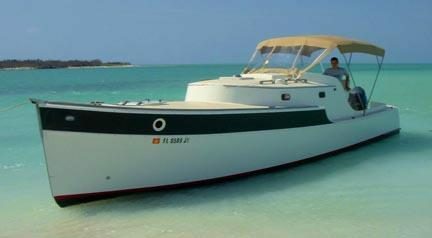 We look forward to consulting with him and providing him assistance when necessary as he brings the boat to completion. I’m hoping this arrangement might be appealing to some other ambitious amatuer builders. Doug’s designs are wonderful to work from, and well within reach for many reasonably capable carpenters. 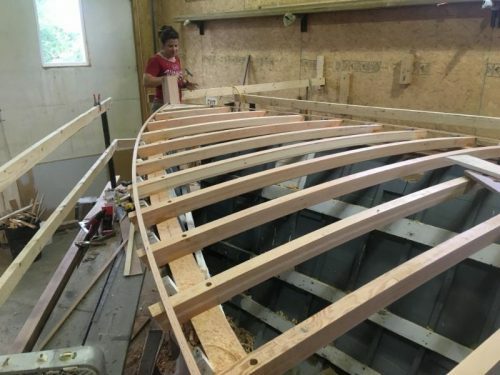 But the logistics of building and rolling a hull the size of Marsh Hen or Bowler are challenging in most home shops. Have us build the hull and call or e-mail whenever you need help. It could be a cost effective and rewarding way to take on a project that might otherwise be out of reach.